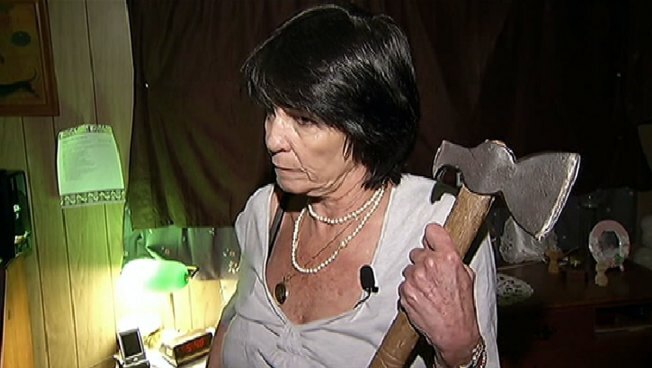 Ax-Wielding Homeowner: "I Hit What I Aim For"
A burglar was scared off early Saturday morning when a skilled ax-thrower grabbed the weapon she keeps next to her bed after she felt the man trying to remove her watch from her wrist as she was sleeping. The burglar, who broke in through a window, had already ransacked other rooms before entering the bedroom. The homeowner awoke Saturday at about 8 a.m. when she felt someone touching her wrist. "I sat up and screamed," said Robin Irvine. "He was taking my watch off." That's when Irvine reached down and grabbed her bed-side ax, which leans against a small table, and took aim. Wearing her underwear and T-shirt and harboring no reservations about unleashing the ax, she chased the man down the hall. "I would’ve gotten him right in the spine or the back of his head," she said. "I hit what I aim for." Irvine told NBC4 she learned to throw the ax when she was growing up in the mountains north of Hemet. "I've always kept it up," she said. "I've had this one for years. It's old, but it's perfectly balanced." The man was last seen jumping over a fence and running from the property about 90 miles southeast of downtown Los Angeles. Hemet police saw a bicycle tire sticking out of a bush just 50 yards from the apartment, where they found the alleged burglar and bags of various items. Nicholas Illoa, 22, was arrested in connection with the burglary and was booked at Riverside County Jail.